Slightly over a year ago, Roku announced three new streaming devices - the Roku Express, Roku Premiere, and Roku Ultra. The company's lineup became rather confusing, and the 4K/HDR-ready Roku Ultra was a hard sell against the $69 Chromecast Ultra. Today, the company announced a refresh for its entire hardware lineup, alongside a major new OS update. If you're not familiar with Roku's hardware, there is a lot of it. There was the $29 Express and $39 Express+, which were basic 1080p-capable sticks. The $79 Roku Premiere and $99 Premiere+ were the mid-range options, with faster processors and 4K support (the Premiere+ had HDR as well). At the top end was the $129 Ultra, with all the features of the Premiere+, plus Dolby Digital/Digital plus sound decoding and a voice remote. Roku Express and Express+: These are staying at $29.99/$39.99, but Roku says the new models are five times more powerful than the previous generation. Just like last year, the only difference between the models is that the Express only has HDMI, but the Express+ has HDMI and composite A/V. However, neither model will have a voice remote. Roku Streaming Stick: This replaces the Roku Premiere, and costs $49.99. It has a quad-core processor, 802.11 AC dual-band MIMO wireless, and a voice remote. The stick maxes out at 1080p. Roku Streaming Stick+: This costs $69.99, and replaces the Premiere+. It's essentially Roku's Chromecast Ultra competitor, with 4K/HDR support and "four times the wireless range than the 2016 Roku Streaming Stick." There's also a voice remote. Roku Ultra: The Ultra is getting a price reduction this year, going from $129 to $99. It has everything the Streaming Stick+ has, with an added Ethernet port and microSD card slot. The remote has a headphone jack (similar to a PS4/Xbox One controller) for private listening, in addition to the usual voice functionality. All these models will be available for pre-order starting today from Walmart, Best Buy, Amazon, and other retailers. The Streaming Stick+ is exclusive to Walmart, for some reason. 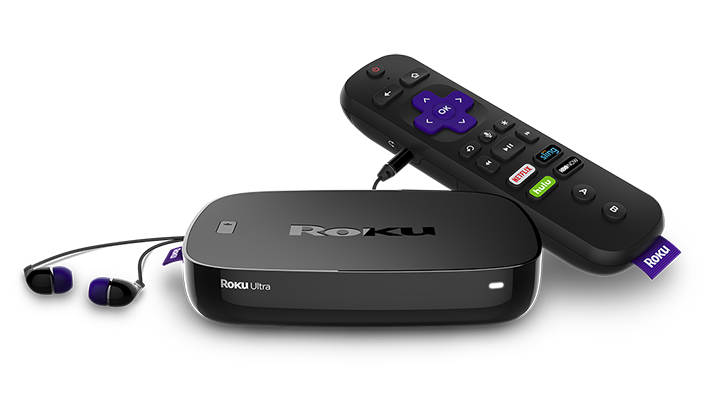 All of the devices announced today (as well as all former Roku models, by the end of the year) run Roku OS 8. The new update focuses on support for over-the-air antennas, with a new 'Smart Guide' that integrates local broadcast data (via an antenna) with streaming options, for easier content discovery. Roku search results also now include over-the-air content. Voice control is another highlight feature, with all the above devices (minus the Express/Express+) shipping with voice remotes. Similar to Fire TV OS and Android TV, voice control can be used to switch inputs, tune to a local broadcast channel, launch a streaming app, and more. You can also use the Roku app on iOS and Android as a voice remote, and Roku has been working on improving natural language understanding. Similar to the Apple TV, Roku is also adding support for TV Everywhere (TVE) single sign-on, so you won't have to repeatedly enter your cable credentials to access content. Finally, the redesigned Roku 4K Spotlight Channel makes it easier to discover 4K/HDR content available for Roku devices. You can see the entire changelog here.